Ayurveda recommends that in order to maintain optimal levels of vitality, clarity and youthfulness it is important that one internally purifies the body and mind. There are many ways to cleanse through ayurvedic processes. One of the most advanced forms is called Kaya Kalpa and is said to be so effective that it can extend the lifespan for many years and in the lives of yogis even decades! Another popular type of ayurvedic cleanse is called Pancha Karma, which requires the assistance of an ayurvedic doctor, skilled masseuses and other ayurvedic specialists. A simpler form of self cleansing, however, is using special ayurvedic herbs. In combination with a vegetarian diet, yoga asana, deep breathing and meditation the ayurvedic herbs can work wonders in penetrating the tissues of the body and removing accumulated toxins held deep within the cellular walls. 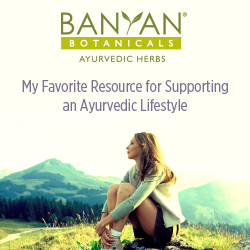 To know which specific herbs are best for your unique body type click on one of the buttons below if you already know your elemental constitution (dosha). If you’re new to ayurveda and want to find out what your body type is then take our 2 minute ayurveda self test to begin to understand your unique ayurvedic body/mind type.